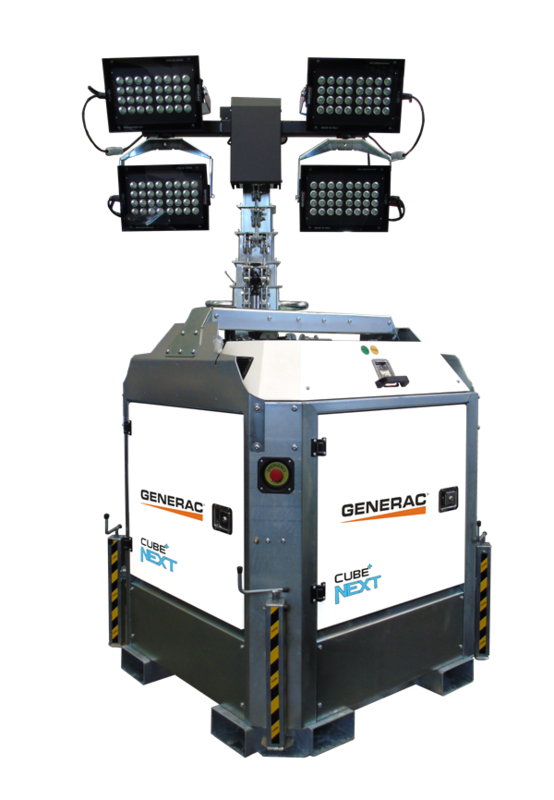 The CUBE+ Next light tower is a new battery powered model that has been designed to attain the highest levels of performance and safety with total respect for the environment. Providing the longestrange in battery powered lighting towers we have set the standard. 4x150W or 4x300W high efficiency LED lamps designed by Generac® Tower Light. The digital timer and the darkness sensor are installed as standard, so that the CUBE+ Next can automatically start and stop. When the CUBE+ Next light tower is powered through the battery pack, it is completely silent and doesn’t emit carbon dioxide (CO2). An ideal solution for events and working areas with low noise or CO2 emission requirements. Thanks to the dimmable LED lamps set to minimum value, this model can run up to 200 hours before recharging the battery pack. Instead if the requirement is to obtain the widest illuminated area, by setting the dimmer knob at 100% the CUBE+ Next can illuminate 2500 m2 (with 4x150W version) or 4200 m2 (with 4x300W version). The CUBE+ Next light tower has a new bolted frame for a much better resistance to vibrations, wear and rust. It offers the best reliability and durability in the industry. The new adjustable locking system embedded in the machine frame. A step forward from competition standard locking system. No more removable external lockers, when CUBE+ Next doors are locked, it’s impossible to change position or even remove stabilizers. 4 wide doors provide a complete access to the technical area.